Based on the true story of William Finn, the autobiographical musical A New Brain (by Finn and James Lapine) tells the tale of a composer, Gordon Michael Schwin, who, in the midst of writing a song for work, collapses at lunch one day. It turns out that, unbeknownst to himself or his doting mother, he was born with brain arteriovenous malformation and now must undergo surgery immediately. Gordon (played in this Gallery Players production by the phenomenal Jesse Menocherian) is thoroughly blindsided and frightened by this news, and he wonders if he is the only one who sees the severity of the situation. His mother, Mimi (Anette Michelle Sanders), smiles through the diagnosis given by Dr. Jafar (Adam David Pearce) and declares she will go to Gordon’s apartment for her “date with Mr. Clean!”; Gordon’s boyfriend, Roger (Gerardo Vallejo), is off sailing and might not make it in time to Gordon’s side. Throughout all of this, Gordon is visited by visions of his boss, Mr. Bungee (Jim Roumeles), who appears as the life-sized frog from the children’s show for which Gordon composes. 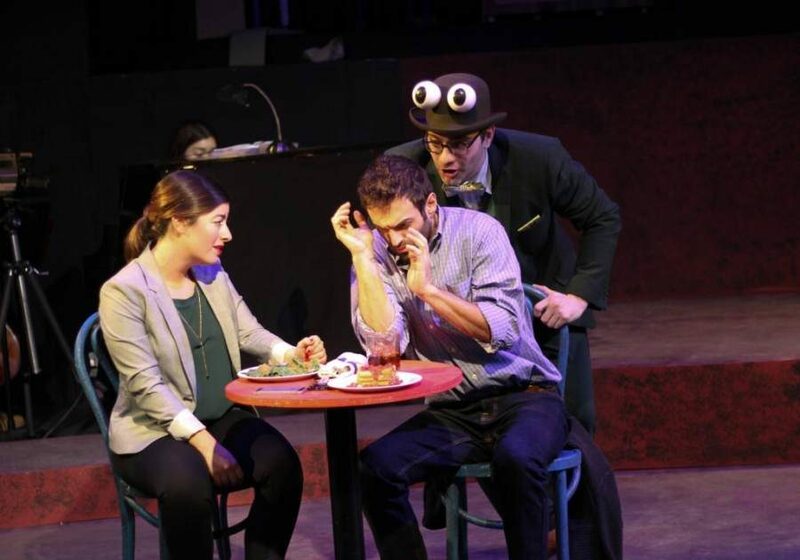 Mr. Bungee vacillates between jovial and avuncular as the frog and demanding and unreasonable as the boss, representing the stress and frustration as an artist that Gordon felt leading up to his collapse. Another recurring character is a rather vicious, unlikable homeless woman, portrayed by Laura Cetti. She demands change -- not necessarily money -- but does nothing herself about it. Under the direction of Barrie Gelles, the cast brings forward their various characters’ points-of-view adeptly and spiritedly. Their “hey kids, we’re in a musical!” vibe is reminiscent of the days of Judy Garland and Mickey Rooney, providing a sharp contrast to Gordon’s impending and potentially life-threatening surgery. Providing a grounding presence is Rhoda, Gordon’s coworker with whom he is having lunch when he collapses. Portrayed by the marvelous Alyson Leigh Rosenfeld, Rhoda is calm, caring and put-together. Rosenfeld’s singing voice is bright and clear, and the fluidity of movement she shows playing a marionette version of her character in a dream sequence is nothing short of extraordinary. The nice nurse Richard (Justin Phillips), meanwhile, is a welcome presence in the harrowing hospital scenes. Richard’s care for Gordon as a professional and a person is great to witness, and Phillips' acting and singing is flawless in the role. And Sanders as Mimi is heartrending when she sings of how, having been left by her husband when she was just a young mother, she might well live for several more decades without her son. Her fear of facing this possibility all alone is palpable. The entire ensemble harmonizes well in their singing. There are numerous intricate dance sequences as well, including a rather inspired tango scene, from dance captain and ensemble member Samantha Schiffman. The talented ensemble includes Stewart Yu (primarily as the smiling minister), Christy Yin, Sharaé Moultrie, Justine Campbell-Elliott, Ashley Harris, and Max Joseph. Everyone’s voices and energy blends well as they see Gordon through his journey.